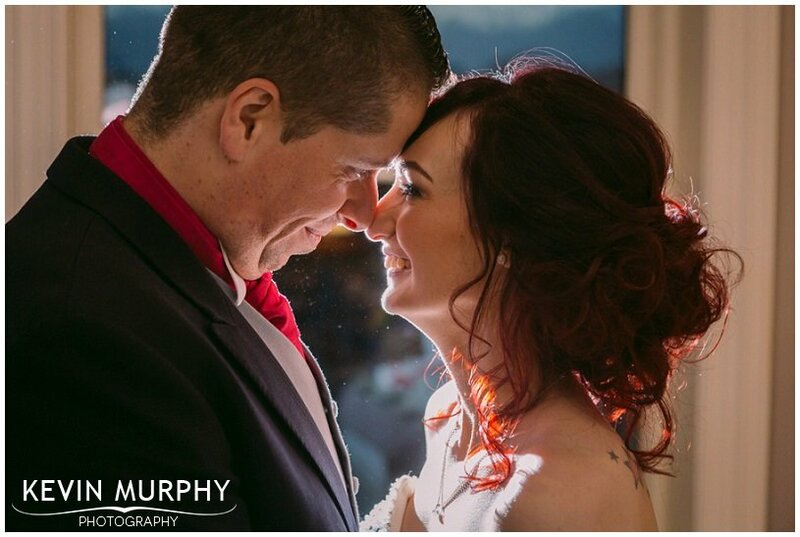 Sinead and Phil were married in Mountshannon church and held their reception in the Lakeside Hotel. It was a blend of Irish and Scottish with a big dollop of their own personalities thrown in and it was a fantastic mixture. The laughter at Sinead’s house that morning. From Timmy Dooley to other outrageous stories I had a sore face from laughing by the time I left! Sinead’s Charlotte Mills wedding shoes, with their something old, new, borrowed and blue. Having brooches from Sinead and Phil’s grandmothers attached to Sinead’s bouquet. The gift box Phil sent to Sinead that morning – including a bottle of champagne from the year she was born. Phil having his father as his best man. Phil wearing his grandfather’s cuff links and using his great grandfathers suitcase to hold the mass booklets. Fr John’s sermon which was all the more personal having know Sinead since she was an altar server. The wooden tree stumps, vintage bottles and handmade blackboards made from driftwood by Phil. Thank you so much for everything you did for our wedding. You were amazing throughout the whole day and had everyone commenting on how nice you were also. It meant a lot to us to have such a relaxed photographer and you made us, as well as our family and friends, feel so at ease. The slideshow at the end of the day actually made me cry, it was so special. You captured the day so well and it was everything we could have hoped for and more. The caricature invites and matching signing frame. Brid’s excitement as she walked up the aisle. The gardens in the Lakeside in full bloom for photographs. 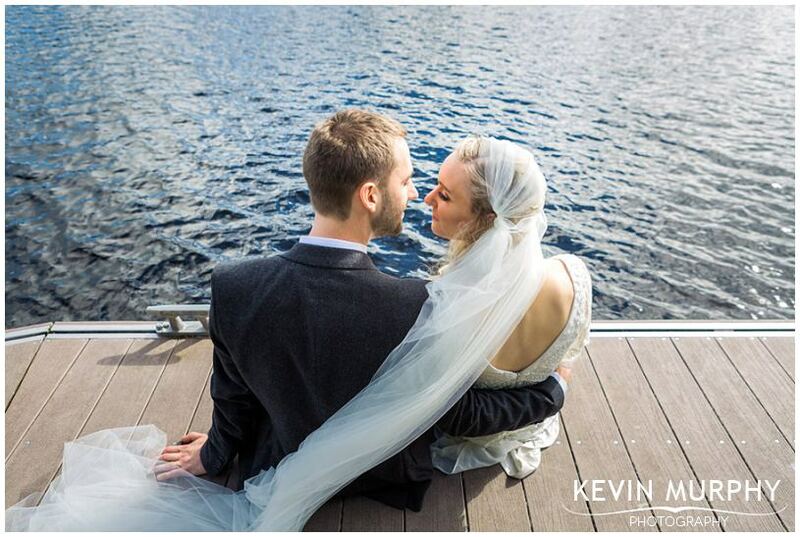 Sharon and Tom held their entire wedding the Lakeside Hotel in Killaloe. Given the weather we had that day, it turned out to be a genius idea! Having everything under the one roof meant that the weather didn’t matter and everyone had a great time (especially at the rowdy Bellisimo table! ;)). Sharon and Tom have a great mutual sense of humour so it was a pleasure to hang out with them for the day and tell their wedding story. The rainbow arching over the hotel when I arrived. Little did I know that would be my last photograph outside! Tom’s reaction to the gift Sharon got for him. Sharon’s wedding shoes. Sure, they weren’t the most comfortable pair of shoes in the world, but they were pretty spectacular – and their names and wedding date were printed inside too. Sharon and her Dad sticking their tongues out at Sharon’s mother as they walked down the aisle, mimicking a photo from Sharon’s parents wedding day. Sharon’s brother going rogue during his reading and adding his own verses. Keano quickly attaching a ball and chain to Tom’s ankle the second the ceremony was over! The signing frame and date night ideas. 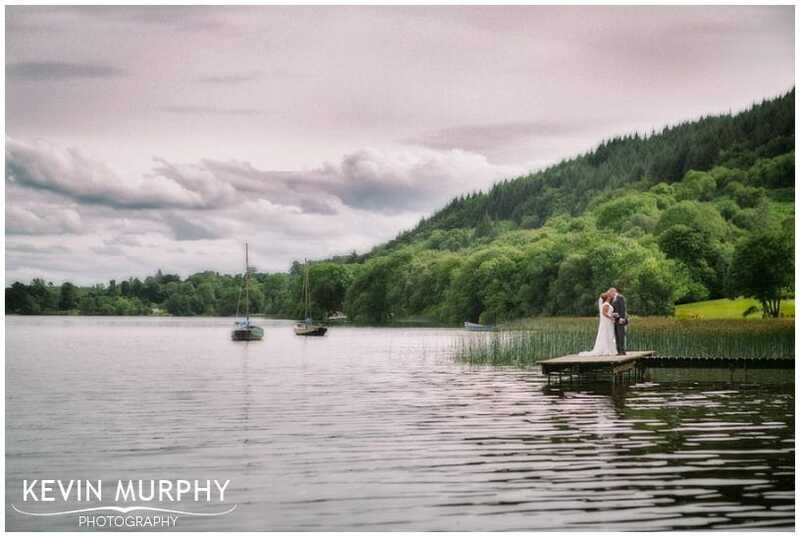 Alison and John were married in Ogonelloe church and held their reception in the Lakeside Hotel Killaloe. I don’t know where to even start in summarising their wedding day – there was so much going on and such an incredible amount of thought and effort put into it that it’s can’t be condensed into a paragraph. John is hands down the most romantic groom I’ve ever met – I would put every man to shame if I listed everything he did in the run up to the wedding. However, one thing that stands out is presenting his future bride with golden envelopes in the lead up to the big day (along with a bonus golden envelope on bank holidays!) which contained gifts and surprises – culminating in a once in a lifetime experience when Alison gets to feed penguins on their honeymoon. Incredible! Between them they make the dream team for not only coming up with great ideas but making them happen. I’d love to have their wedding day all over again – it all went by too fast. Hanging out with John and the groomsmen for a little while that morning – what a great bunch of lads. From emotional cards and personalised gifts to one man’s determination to grow his hair until he’s walking on it to drinking empty pints – it was great craic! Turning up to the bride’s house to find her dressed as a penguin (of course), complete with beak and flippers, harassing her neighbours with trick or treat. Fr. Chris delivering an epic sermon (as always). As he said himself he was spoiled for choice with these two – but in the end his tea towel inspired (pillow slip) Winnie The Pooh quotes were brilliant. A Lord Of The Rings sword to cut the cake (and randomly knight people when they weren’t looking!). Personally carved pumpkins on each table, as well as a chapter from their story. Alison and John presenting a mini birthday cake to their guests who had celebrated big birthdays that year which they had missed. Anika and Mike met when Anika worked in a bar. Mike went to that bar for three weeks and eventually got her phone number. Two years later they got engaged and finally their wedding day rolled around. 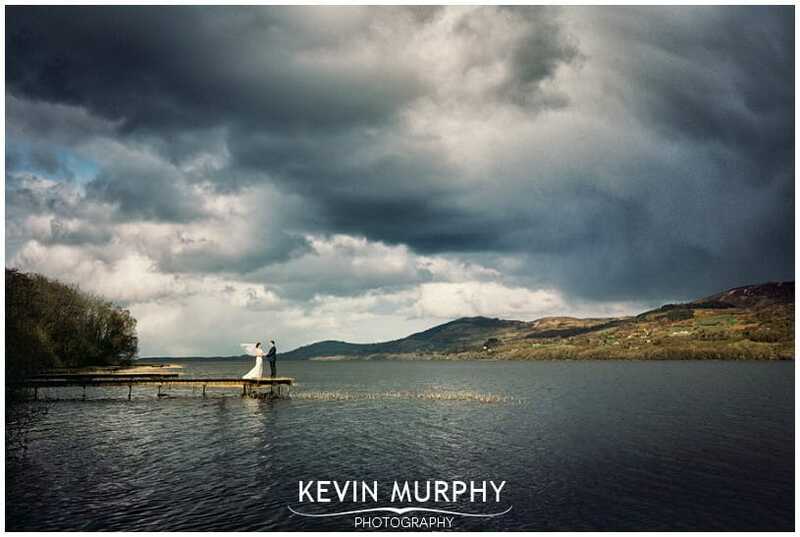 They were married in Kilbane church and held their reception in the Lakeside Hotel in Killaloe. Anika’s house. It reminded me a little of a cob house, full of character (and little nooks and crannies!) and the gardens were fantastic too – so much so that I brought a lot of the little details outside to photograph them. Selfie’s! Nobody was safe from them – not even Buttons! Oisín’s sign as he walked up the aisle. Secretly stalling Anika when she arrived at the church because somebody forgot to bring the wedding rings!! Mike’s (unknown) plea for help on his shoes. Their Dutch horse ride to the local pub. A surprise visit to Mike’s uncle Michael. Anika, Mikey and the bridal party arriving at the Lakeside Hotel by boat. Mike and I would like to thank you from the button of our hearts for everything you did on our wedding day. You were an absolute pleasure to work with from the start to finish and your approach is most definitely natural, discreet and unobtrusive. You did exactly what it said on the tin!!!! You captured so much of the day for us and you made it seem so effortless. It was lovely having you at the house that morning you fitted right in, just like one of the girls!!!! I’ll never forget the girls running up the stairs shouting “he is gone outside with your dress and shoes is he mad”! Everyone has been raving about the slide show and it was an amazing addition to our day you capture all the moments. I have had so many of our guest compliment on how good you were and how they never even noticed you were taking picture of them most of the time. You thought of everything and no word can express how grateful we are. The kids excitement and Mairead’s house that morning. The flowers. Wow. 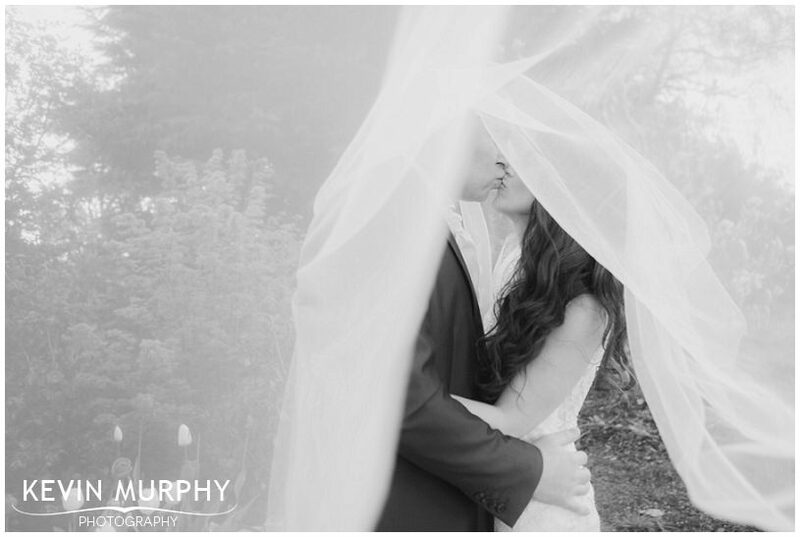 They were done by Mairead’s mother and when I scouted the church a few days ahead of the wedding they had already started working on them. Their hard work paid off, they were incredible. 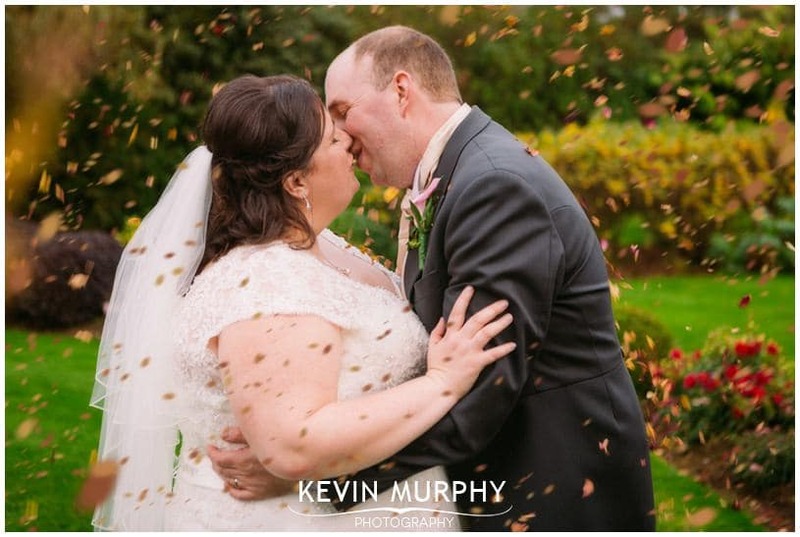 The stories shared in the speeches – from the first time Seán’s parents met Mairead to nostril wheel removal! 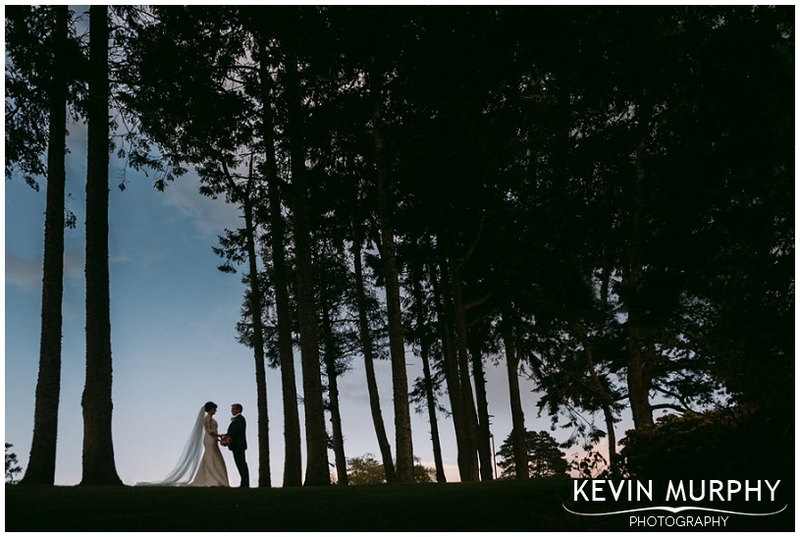 Amelia and Adrian were married in Ennis Cathedral and held their reception in the Lakeside hotel in Killaloe. They have two beautiful daughters – Ruby and Lavinia – who were not only the flower girls but also the stars of the show! Despite already having a family Amelia and Adrian were as excited and in love and giddy (and maybe a tiny little bit nervous) as any newlyweds. It was lovely to be there to witness it. Adrian’s gift to Amelia that morning – a biography of Jose Mourinho! Ruby’s new glasses – bought especially for the wedding – very cool. The little details around the drinks reception in the Lakeside Hotel. There was a lot of thought put into it. The speeches – which ranged from very emotional to laugh out loud funny. Ruby’s birthday falling at the same time, it must have been her best weekend ever!